DIE Mercurii, videlicet, 6 die Julii. Propositions for the Defence of Hull. Resolutions for disposing of the Money come in upon Propositions for raising Horses, etc. and Protests against them. 10000 Foot to be raised in London, and in the adjacent Counties. Horses brought in to be inustered. 500 Men to be sent to Hull by Sea. and with Votes for further Assistance to Hull. Committee to draw up Propositions for composing all Differences between the King and Parliament. and for an Order to indemnify Voluntiers raised in Kent. The Order to be general to all Counties. The King's Letter brought up from the H. C. to be sent to Him. Message to the H. C. in Answer to the Propositions at the Conference. Order for 100 l. to be paid to Lord Dungarvan, for Youghall. Message from the H. C. with the Two following Ordinances. 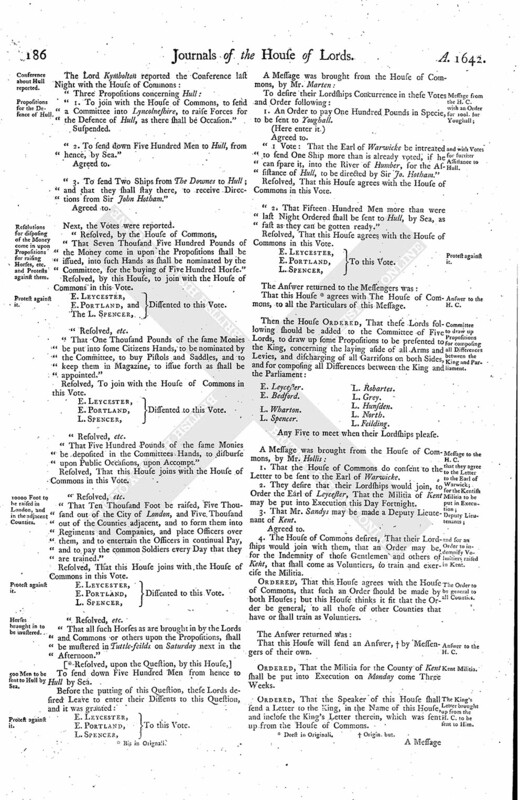 The Ordinance for raising 2000 Men for relieving Hull. Commission for Captains for these Forces. Wiseman released upon his Petition. Letter from Lord Brooke, that the Warwick Milita is put in Execution. Letter of Thanks to be sent him from the Speaker. The Speaker's Letter to the King, inclosing the Letter belonging to His Majesty. Captain; Commission in the new-raised Forces for Hull, and he to appoint his Subalterns. Upon reading the Petition of Ezecheill Johnson; it is Ordered, That the former Orders of this House in this Cause shall be confirmed; and the Parties to be sent for that have disobeyed the said Orders. "1. To join with the House of Commons, to send a Committee into Lyncolneshire, to raise Forces for the Defence of Hull, as there shall be Occasion." Suspended. "2. To send down Five Hundred Men to Hull, from hence, by Sea." "3. To send Two Ships from The Downes to Hull; and that they shall stay there, to receive Directions from Sir John Hotham." Next, the Votes were reported. "That Seven Thousand Five Hundred Pounds of the Money come in upon the Propositions shall be issued, into such Hands as shall be nominated by the Committee, for the buying of Five Hundred Horse." Resolved, by this House, to join with the House of Commons in this Vote. E. Leycester, Dissented to this Vote. "That One Thousand Pounds of the same Monies be put into some Citizens Hands, to be nominated by the Committee, to buy Pistols and Saddles, and to keep them in Magazine, to issue forth as shall be appointed." Resolved, To join with the House of Commons in this Vote. "That Five Hundred Pounds of the same Monies be deposited in the Committees Hands, to disburse upon Public Occasions, upon Accompt." Resolved, That this House joins with the House of Commons in this Vote. "That Ten Thousand Foot be raised, Five Thousand out of the City of London, and Five Thousand out of the Counties adjacent, and to form them into Regiments and Companies, and place Officers over them, and to entertain the Officers in continual Pay, and to pay the common Soldiers every Day that they are trained." "That all such Horses as are brought in by the Lords and Commons or others upon the Propositions, shall be mustered in Tuttle-feilds on Saturday next in the Afternoon." To send down Five Hundred Men from hence to Hull by Sea. E. Leycester, To this Vote. 1. An Order to pay One Hundred Pounds in Specie, to be sent to Youghall. "1 Vote: That the Earl of Warwicke be intreated to send One Ship more than is already voted, if he can spare it, into the River of Humber, for the Assistance of Hull, to be directed by Sir Jo. Hotham." Resolved, That this House agrees with the House of Commons in this Vote. "2. That Fifteen Hundred Men more than were last Night Ordered shall be sent to Hull, by Sea, as fast as they can be gotten ready." That this House (fn. 2) agrees with The House of Commons, to all the Particulars of this Message. Any Five to meet when their Lordships please. 1. That the House of Commons do consent to the Letter to be sent to the Earl of Warwicke. 2. They desire that their Lordships would join, to Order the Earl of Leycester, That the Militia of Kent may be put into Execution this Day Fortnight. 3. That Mr. Sandys may be made a Deputy Lieutenant of Kent. 4. The House of Commons desires, That their Lordships would join with them, that an Order may be, for the Indemnity of those Gentlemen and others of Kent, that shall come as Voluntiers, to train and exercise the Militia. Ordered, That this House agrees with the House of Commons, that such an Order should be made by both Houses; but this House thinks it fit that the Order be general, to all those of other Counties that have or shall train as Voluntiers. That this House will send an Answer, (fn. 3) by Messengers of their own. Ordered, That the Militia for the County of Kent shall be put into Execution on Monday come Three Weeks. Ordered, That the Speaker of this House shall send a Letter to the King, in the Name of this House, and inclose the King's Letter therein, which was sent up from the House of Commons. "It is this Day Ordered, by the Lords and Commons assembled in Parliament, That One Hundred Pounds, out of the Contribution-money collected at Dover, for the Relief of Ireland, in Specie, [ (fn. 5) be pad to the Lord Dungarvan, to be by him sent over to Youghall, in the Province of Munster, in the Kingdom of Ireland, to be distributed there, for the Relief of those distressed Protestants that are in that Town, and in great Necessity." Resolved, upon the Question, That this House approves of these Two Ordinances. "It is Ordained, by the Lords and Commons in Parliament, That Two Thousand Men shall be forthwith sent, for the Relief and Defence of the Town of Hull, and assisting Sir John Hotham in keeping the same, according to the former Ordinance in that Behalf; which Men are to be raised, by the beating of the Drum, in the City of London, the Suburbs, and adjoining Parts, in the several Counties of Midd. Essex, Kent, and Surrey, or such other Counties of the Kingdom as shall be thought sit by the Committee of Lords and Commons, appointed to take Care for the Defence of the Kingdom; that the said Two Thousand shall be put into Ten Compaines, each Company consisting of Two Hundred Men; all which, after their Arrival in Hull, are to be obedient to Sir Jo. Hotham, Governor there, and to defend the same for His Majesty's Service, and the Peace of the Kingdom, according to the Ordinance of both Houses of Parliament; and in so doing, they shall be protected by the Power and Authority of Parliament." 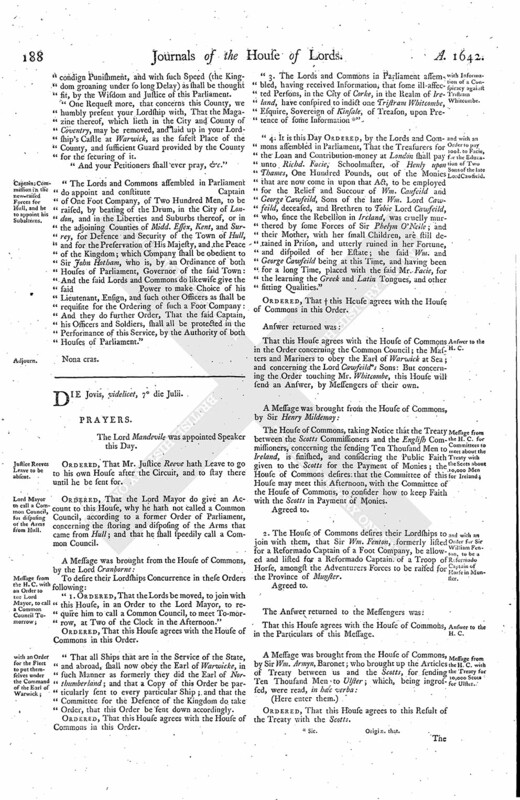 "By Order of the Lords and Commons in Parliament, is appointed Captain of One Foot Company, of Two Hundred Men, to be raised, by beating of the Drum, in the City of London, and in the Liberties and Suburbs thereof, or in the adjoining Counties of Midd. Essex, Kent, and Surrey, for Defence of the Town of Hull, and His Majesty's Safety, and the Peace of the Kingdom, under the Command of Sir John Hotham; and, in Performance hereof, is to be protected by the Power and Authority of both Houses of Parliament." Upon the Petition of Thomas Wiseman, committed by this House to The Fleet, shewing "That he is heartily sorry for his Fault;" it is Ordered, That he shall (fn. 7) be forthwith released of his present Imprisonment. A Letter was read, written from the Lord Brooke, Lord Lieutenant of the County of Warwicke, shewing "That he hath put the Ordinance for the Militia into Execution, and the Trained Bands were full, and that many Voluntiers came in; and that he hath taken the Magazine into the Castle of Warwicke." Ordered, That a Letter be sent to the Lord Brooke, by the Speaker, to give the Lord Brooke Thanks, in the Name of this House, for (fn. 8) his Diligence and Care herein. "I am commanded, by both Your Houses of Parliament, to inform Your Majesty, that they have received certain Letters and Warrants, taken about Mr. Ashburnham; amongst which, as they conceive, there was One sent from Your Majesty to the Queen, which they have commanded me to return unto You in that Manner they received it." (fn. 9) "To the Right Honourable Robert Lord Brooke, Lord Lieutenant of the County of Warwick. 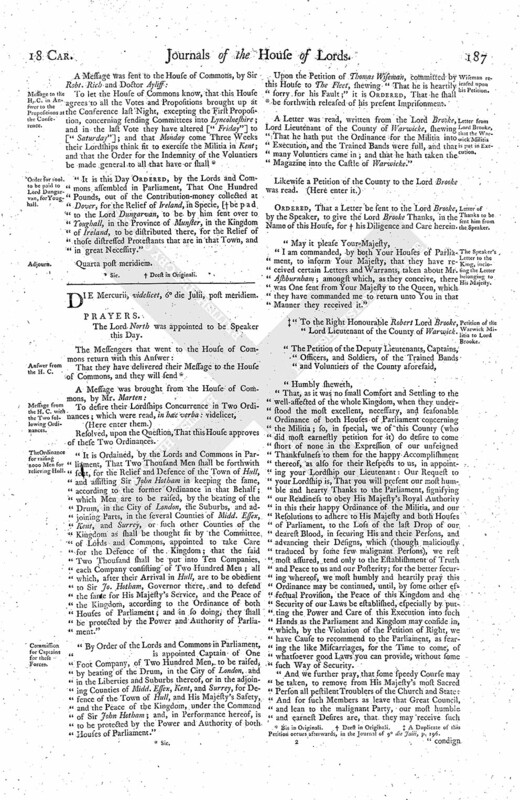 "That, as it was no small Comfort and Settling to the well-affected of the whole Kingdom, when they understood the most excellent, necessary, and seasonable Ordinance of both Houses of Parliament concerning the Militia; so, in special, we of this County (who did most earnestly petition for it) do desire to come short of none in the Expression of our unfeigned Thankfulness to them for the happy Accomplishment thereof, as also for their Respects to us, in appointing your Lordship our Lieutenant: Our Request to your Lordship is, That you will present our most humble and hearty Thanks to the Parliament, signifying our Readiness to obey His Majesty's Royal Authority in this their happy Ordinance of the Militia, and our Resolutions to adhere to His Majesty and both Houses of Parliament, to the Loss of the last Drop of our dearest Blood, in securing His and their Persons, and advancing their Designs, which (though maliciously traduced by some few malignant Persons), we rest most assured, tend only to the Establishment of Truth and Peace to us and our Posterity; for the better securing whereof, we most humbly and heartily pray this Ordinance may be continued, until, by some other effectual Provision, the Peace of this Kingdom and the Security of our Laws be established, especially by putting the Power and Care of this Execution into such Hands as the Parliament and Kingdom may conside in, which, by the Violation of the Petition of Right, we have Cause to recommend to the Parliament, as fearing the like Miscarriages, for the Time to come, of whatsoever good Laws you can provide, without some such Way of Security. "And we further pray, that some speedy Course may be taken, to remove from His Majesty's most Sacred Person all pestilent Troublers of the Church and State: And for such Members as leave that Great Council, and lean to the malignant Party, our most humble and earnest Desires are, that they may receive such condign Punishment, and with such Speed (the Kingdom groaning under so long Delay) as shall be thought fit, by the Wisdom and Justice of this Parliament. 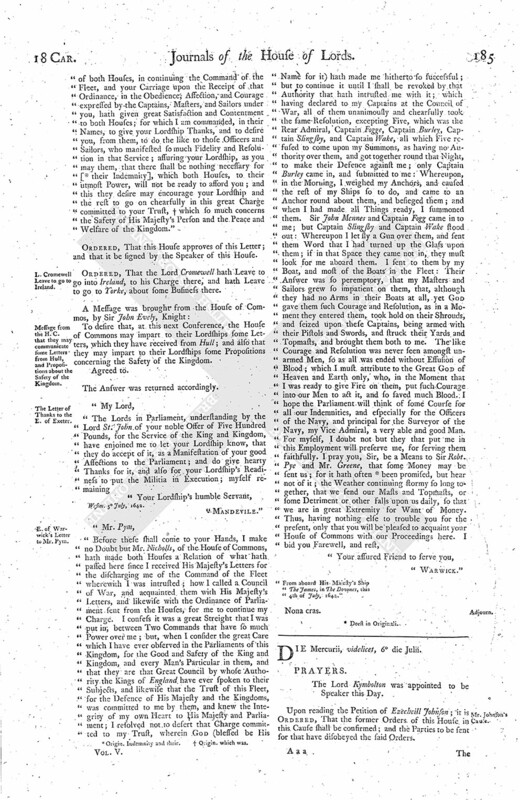 "One Request more, that concerns this County, we humbly present your Lordship with, That the Magazine thereof, which lieth in the City and County of Coventry, may be removed, and laid up in your Lordship's Castle at Warwick, as the safelt Place of the County, and sufficient Guard provided by the County for the securing of it. "The Lords and Commons assembled in Parliament do appoint and constitute Captain of One Foot Company, of Two Hundred Men, to be raised, by beating of the Drum, in the City of London, and in the Liberties and Suburbs thereof, or in the adjoining Counties of Midd. Essex, Kent, and Surrey, for Defence and Security of the Town of Hull, and for the Preservation of His Majesty, and the Peace of the Kingdom; which Company shall be obedient to Sir John Hotham, who is, by an Ordinance of both House of Parliament, Governor of the said Town: And the said Lords and Commons do likewife give the said Power to make Choice of his Lieutenant, Ensign, and such other Officers as shall be requisite for the Ordering of such a Foot Company: And they do further Order, That the said Captain, his Officers and Soldiers, shall all be protected in the Performance of this Service, by the Authority of both Houses of Parliament." 9. A Duplicate of this Petition occurs afterwards, in the Journal of 9 die Julii, p. 196.